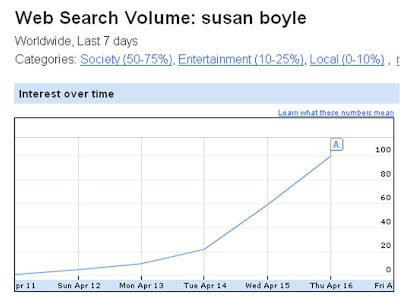 Susan Boyle - Google Insights for Search shows her global celebrity status! On Thursday I wrote about how Britain's Got Talent contestant Susan Boyle was becoming an internet viral superstar. 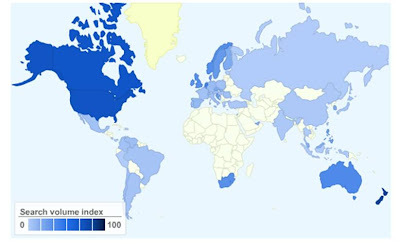 Since then the view counts on YouTube and buzz around the Susan Boyle performance has been getting bigger and bigger - Visible Measures estimating that Susan Boyle's performance has been watched on YouTube over 47 million times! 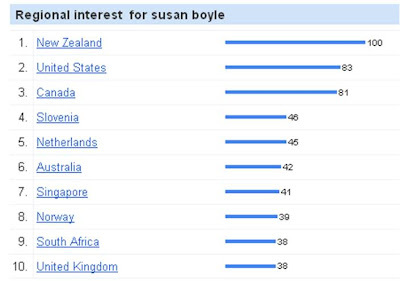 Looking at Google Insights For Search data shows how far the name 'Susan Boyle' has travelled. Though will be interesting to see how long this buzz around Susan Boyle lasts for. Susan Boyle - viral internet sensation! although it looks like hollywood is going to take a beating for a while.